Canadian/British brand OneUp Components has launched a wider range of dropper posts, clever new bars and stems, as well as grips and chain devices at this year’s Sea Otter Classic event. Let’s get stuck in! OneUp makes a very popular multitool, called the EDC (Every Day Carry) which mounts into a fork steerer. However, to fit the special top cap that still allowed headset adjustment, you had to cut a thread into your fork’s steerer. 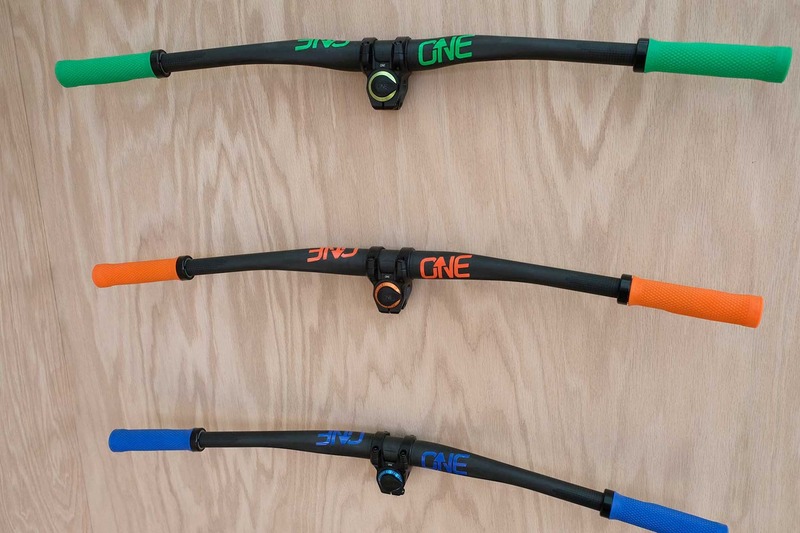 This put off many riders, so OneUp has come up with a solution that keeps your steerer intact. 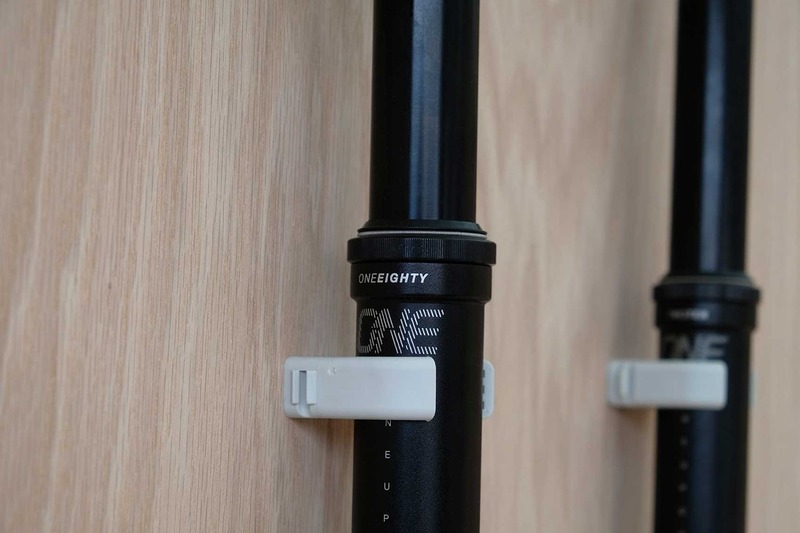 It has created a stem with a headset adjuster built-in: You put slide the stem on and push it down firmly, tightening up the two main steerer bolts on the stem. Below the stem is a removed ring and conical washer to demonstrate what is hiding in the stem body. Sitting below these two bolts is a third one. 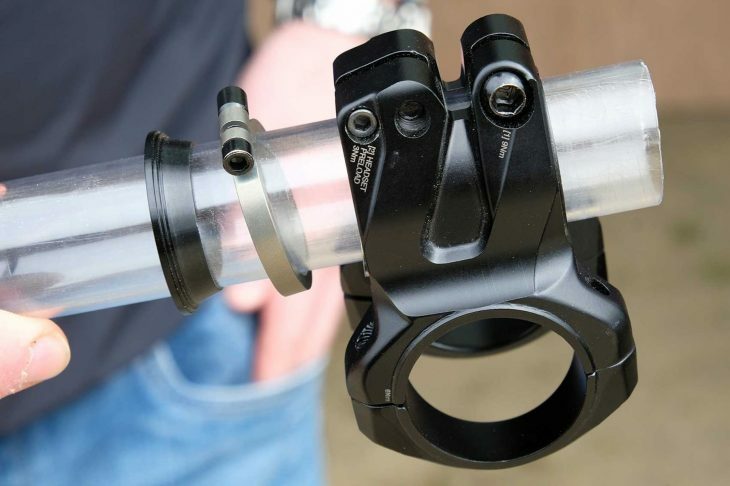 This tightens a ring, that works on a conical washer, taking up the slack in the headset and allowing free access to the top of the steerer tube for your tool or whatever you keep down there. 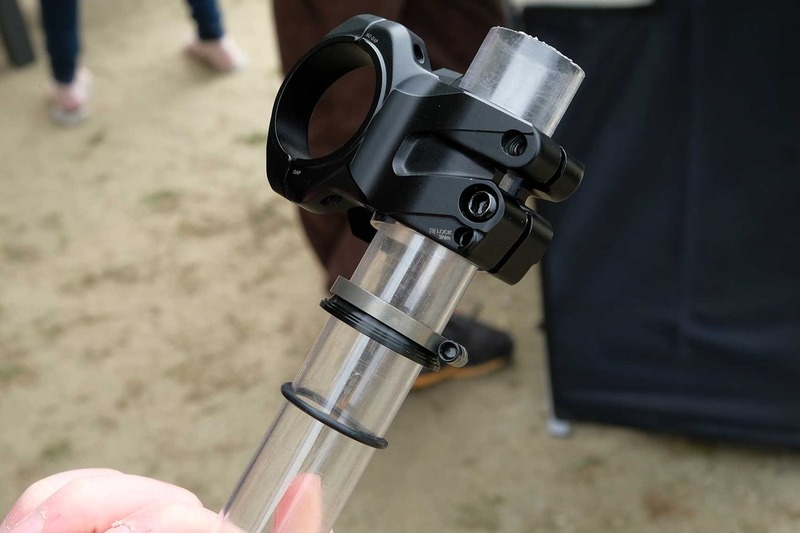 The stem has a 35mm clamp and comes in 35mm and 50mm lengths. 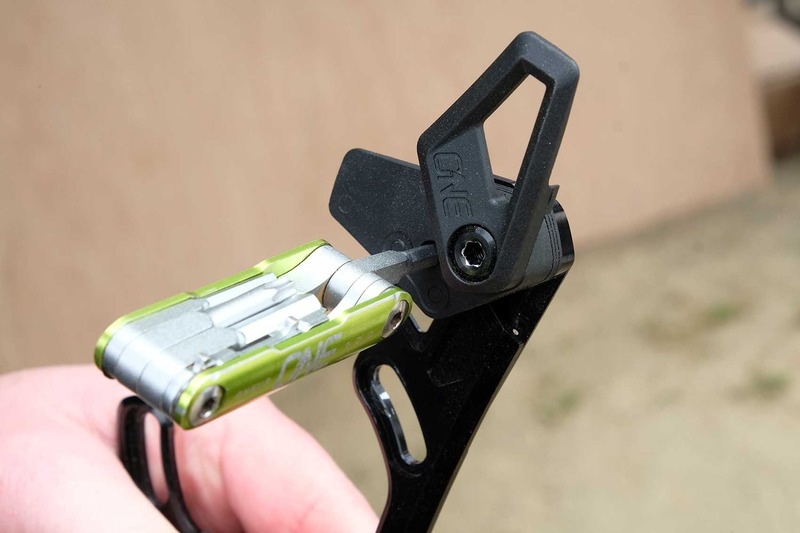 You might remember last year we featured OneUp’s trimmable dropper post shim. This allowed the user to exactly adjust the ‘drop’ of their dropper post by trimming a 30mm shim that sat in the post’s keyways. This seemed a bit too complex for many riders, so OneUp now offers a 10mm and a 20mm shim with each post. 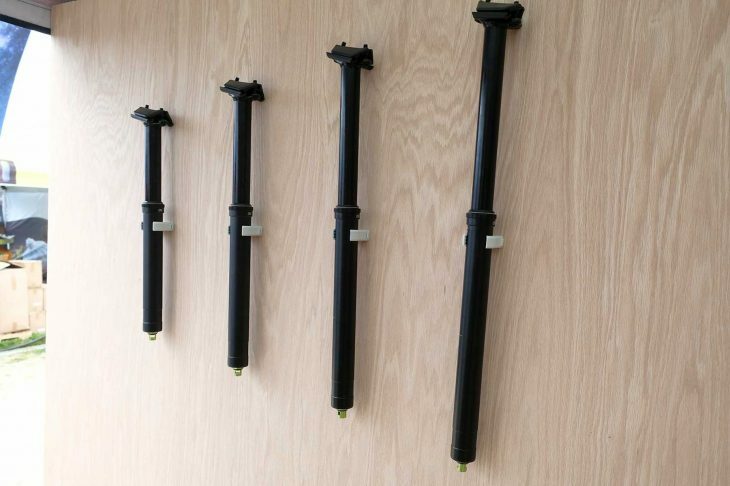 With posts now coming in 120mm, 150mm, 180mm and 210mm, this means that its posts are adjustable from 100mm to 210mm in 10mm increments. Surely enough adjustment for everyone? A bigger range of droppers and adjustments. 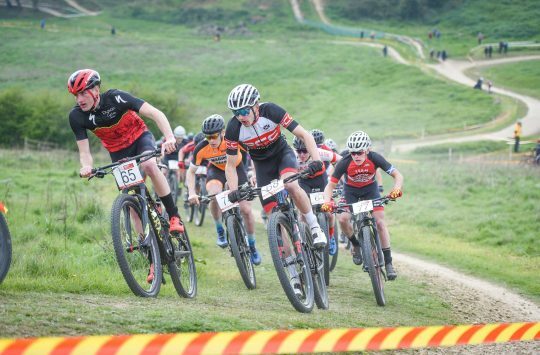 There’s now a dropper from 100mm to 210mm in 10mm increments. 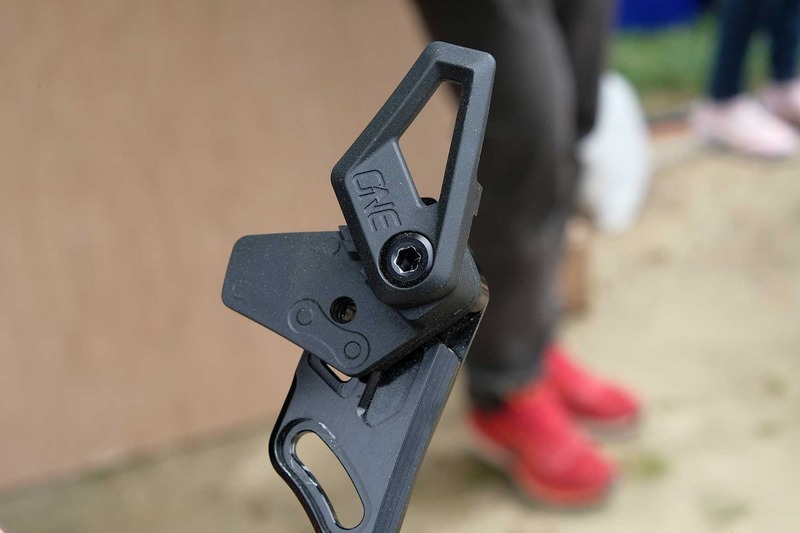 While we’re talking about the dropper, OneUp Components is now making its dropper post lever in a full range of clamps for popular brake/shift mounts, including iSpecII, new iSpecEV, SRAM Matchmaker and a regular bar clamp. 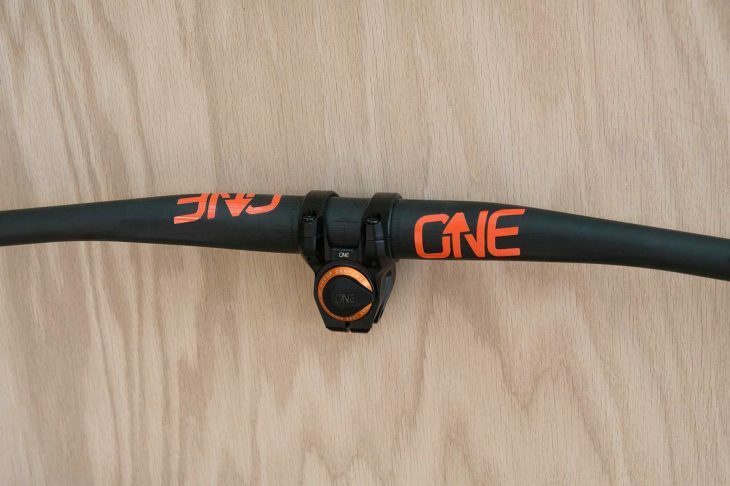 To match the natty stem, OneUp has a new carbon bar. But it had to be clever, didn’t it? 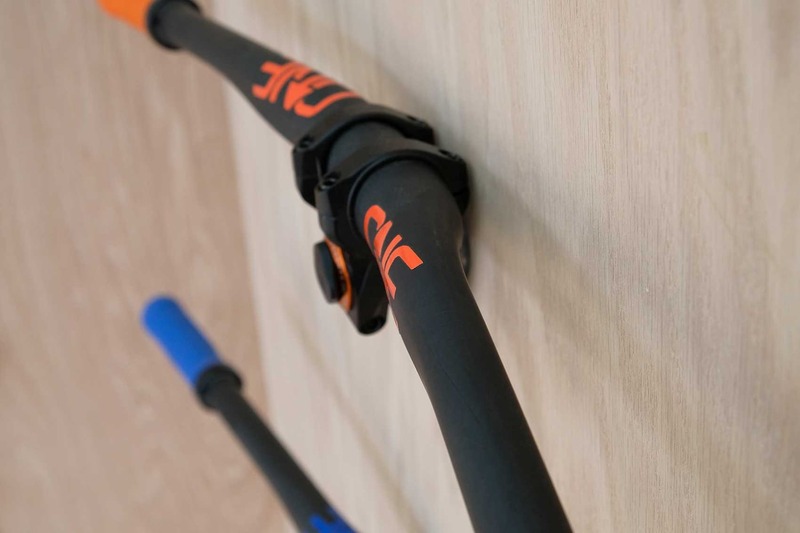 The new OneUp carbon handlebar is horizontally ovalised beyond the handlebar clamps. 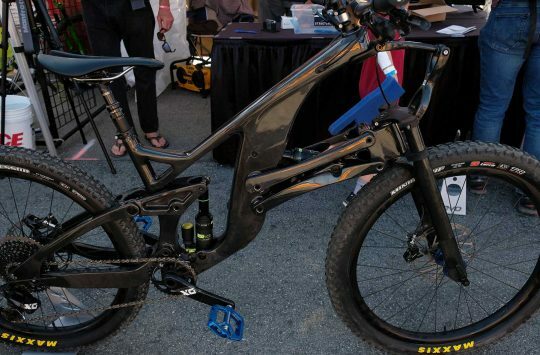 This gives a little more up and down give, while increasing the bar’s stiffness when steering. There’s a small amount of ovalising, just below the ‘NE’ of the logo here. The OneUp Components handlebar will come in 800mm width and 20 or 25mm rise, in 35mm diameter. And it has coloured stickers too to match its… grips! 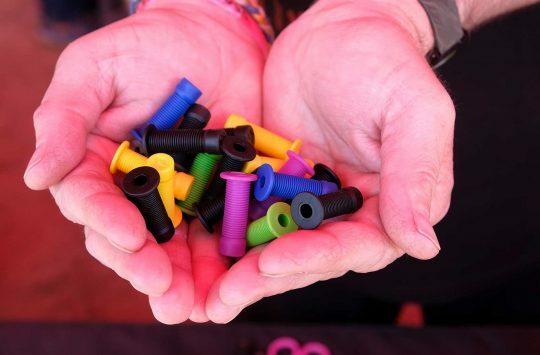 Yep, there are new grips, which feature a single lock-on design and a plastic ‘skeleton’ under the grip rubber. This is cut out in places where your hand needs more cushioning. And there are colours! The top guide now has a tool-free flip-up guide for when it all goes wrong. As well as flipping up, there’s a print of a chain link to allow you to adjust it exactly to size. The tool loosens the guide and you slide it down until the tool rests on the chain. Adjusted! And finally, OneUp Components has had feedback that some customers were worried about ordering online for fear of customs charges from Canada and long waits for bike goodies to arrive. While the company is based in Squamish, it also has a warehouse in the UK, which services European orders, so most in-stock products are sent next-day – and without any customs charges. See oneupcomponents.com for more details. That was indeed the Zero adjustable spacer. I’ve actually bumped into Declan a couple of times in the last year. He was at the Malverns Classic I think. like the problem solvers version? I also like everything coming out of Oneup! 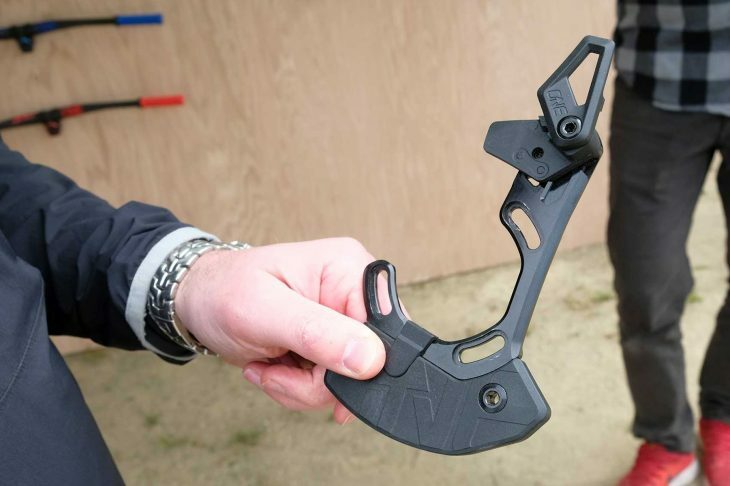 I will definitely be investing in the bar and EDC stem!